HKS designer Julie Hiromoto’s passion for architecture sparked almost 30 years ago when her South Georgia middle school teacher introduced her to drafting and model making. However, Julie’s path to winning a prestigious 2019 Young Architect Award from the American Institute of Architects (AIA) started with her upbringing and diverse life experiences that form the foundation of her career. 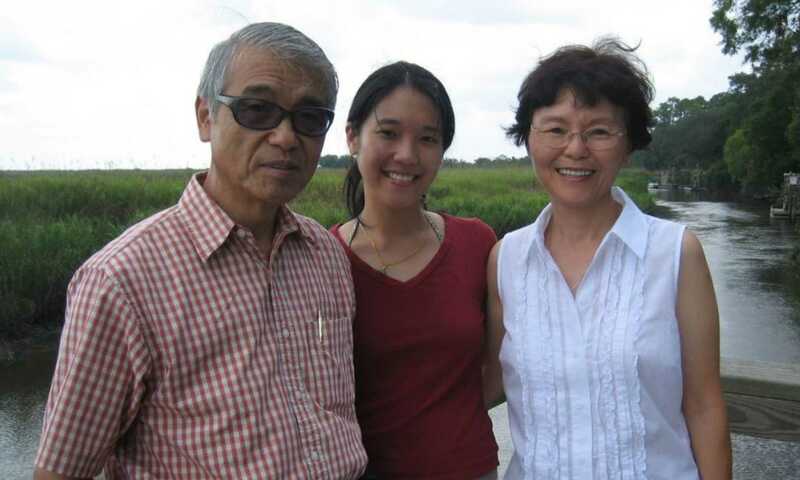 Her father, Jesus, is of Japanese descent but was born and raised in Peru. The oldest of nine children, he studied medicine and immigrated to the U.S. with $100 in his pocket and began his residency training. He met his future wife at a Florida hospital. Julie’s mother, Rosa, was the daughter of a Chinese colonel, a man of means until Julie’s grandparents fled the country with their young family during the Communist Revolution. After studying political science in Taiwan, Rosa followed her eldest sister to the U.S., also with around $100 in savings. Together, Rosa and Jesus raised their family in Valdosta, Georgia, and taught Julie to make the most of every chance by taking responsibility and being resilient. Since her early exposure to architecture, Julie discovered ways to seize opportunities with confidence, vigor and grace, or adapt and make new inroads where necessary. Julie and her parents, Rosa and Jesus. That has led to her becoming a recognized advocate for equity, diversity and inclusion, and a champion for social and environmentally responsible design. Since she joined HKS three years ago, Julie has continued to share these passions with the emerging professionals she coaches, as well as her seasoned colleagues. She understands how critical these goals are to the industry, and to this end Julie works with HKS’ Better Together diversity initiative and is an ambassador for The Living Future Institute. She also helped establish the curriculum of the sustainable development certificate at New York University and taught as an adjunct professor at the Schack Institute of Real Estate. Throughout her career, Julie has received invaluable advice and mentorship from many industry leaders. Julie began to mirror their behavior, but something was missing. Julie reached back to her father’s culture for help. Before starting an architectural graduate program at Columbia University, she moved to the small Japanese town of Taki in Mie Prefecture for two years. This experience taught her to respect other perspectives. Raised to be a proactive problem-solver, her outspoken nature created challenges as she stumbled through Japan’s subtler, yet protocol heavy, societal norms. Instead of being perceived as an enthusiastic college graduate eager to make an impact, she was mistakenly perceived as impatient, insubordinate and disrespectful in this context. Julie learned to adapt her behavior by combining the Japanese philosophies of wa, harmoniously going with the flow of things, and the martial art aikido, which teaches fighters how to redirect and channel the energy of much larger, powerful foes. Julie’s nearly 20 years of professional design experience and nuanced decision making, informed by her cultural background and experiences, has been dedicated to her clients and the communities they serve. To date, her work includes more than 50 lectures and presentations, more than 30 publications and more than 35 awards. That includes this year’s AIA Young Architect Award that honors designers who have shown exceptional leadership and made significant contributions to the architecture profession within the first 10 years of licensure. In addition, Julie has held leadership positions on national AIA committees, the Large Firm Roundtable and other industry-related organizations.